See our selection of Key Cabinets. We offer a wide variety of key tags for key cabinets, both slot style and hook style. We are a bit unusual in that we sell smaller lot sizes than most. 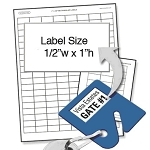 We offer tags in a variety of colors and shapes, with or without numbers. We also have out tags available for keys loaned out. More Tags are on order - Expect delivery soon!